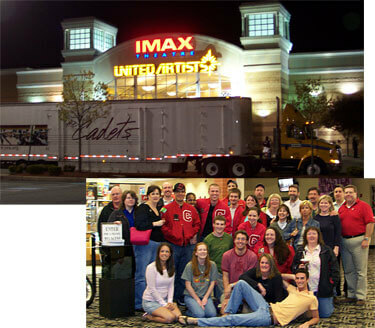 As it turned out, the Cadets' equipment truck was on its way past the theater on its way to this weekend's rehearsal camp, so we thought we'd bring a real taste of drum corps to the movie goers. The second photo is chock full of Crossmen and YEA! personalities, including: Crossmen Director Scott Litzenberg and his wife, YEA! Board of Directors and Crossmen alumni Jim Doyle and Grant Davis, Crossmen alumni president Rick Reedy, YEA! office team members Tiffany Duncan and Deb Rogerson, YEA! volunteers Bob and Terri Fields, along with current and past Crossmen members and friends and fans of DCI at the King of Prussia, Pa. event. 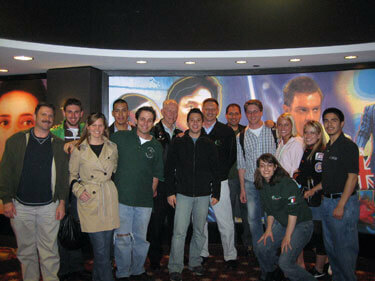 This picture was taken at the Galaxy United Artist Theater in Fishers, Ind. Pictured from left to right are Madison alums Stuart Shade (1976 contra), Jonathan Flodder (2005 baritone), Patrick Schiess (2005, 2006 mellophone) and Christopher Jackson (2004, 2006 soprano). Stu and I (Patrick) both attended the Classic Countdown in 2005 and found the event exciting and fun. In addition, I think it's cool to meet some of the local drum corps fans. I can't wait for this marching season and hope to make it to the 2007 Classic Countdown! 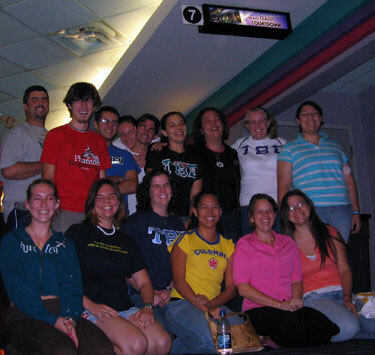 The University of Miami chapter of Tau Beta Sigma sponsored a trip to The Falls movie theater in Miami. 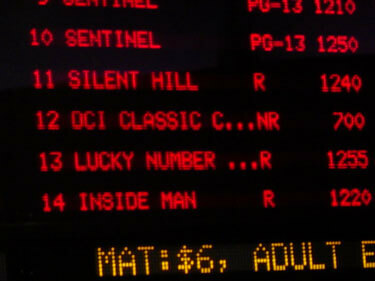 If you look really closely, you can see we're standing under the theater sign for the Countdown. Go Canes! 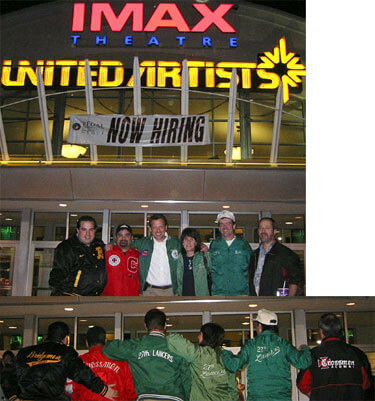 At the ticket office for the Regal 20 in Opry Mills, Nashville, Tenn.
A group of notable drum corps crazies (See Cavaliers' corps director Jeff Fiedler in the picture) gathered at a theater in downtown Chicago for the second annual Classic Countdown. About 70 patrons, many representing The Cavaliers, Pioneer, Phantom Regiment and Guardsmen chose a smaller downtown theater for this event, and cheered on all the corps as DCI showcased some of its best for the second year up on the big screen. 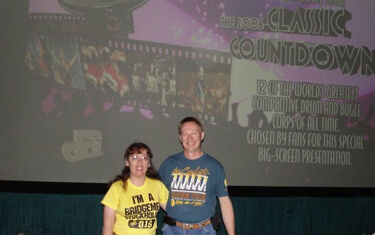 Here are a couple pictures of Myra and Frank Karycinski wearing their "classic" 1980s Bridgemen "Stockholder" and Cadets "Racing Team" T-shirts at the 2006 Classic Countdown at the Regal Town Center 16 in Kennesaw, Ga. 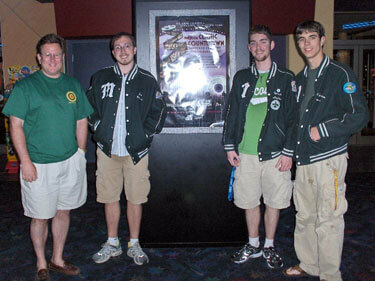 It was a packed house with many fans wearing their drum corps T-shirts or patch-covered member jackets. There was applause after every performance, cheers after that fantastic horn solo in the Cadets' performance and a hearty "blooo" after the Bluecoats show. We've been fans since we first saw competitions in Roosevelt Stadium in Union City, N.J. in the 1970s while in high school. All of the corps would march right up our street in parade fashion before entering the stadium. The threads that weave together our group of drum corps people are rather complicated. 1. Kevin McDermott marched '92+'94 Crossmen horn line, currently in alumni for Bridegmen and Reilly Raiders Sr. In King of Prussia, Pa., after the Countdown, three Lancers went to the nearest restaurant/bar where we had drinks and sang "Danny Boy," no actually we just talked about the past and the future and sang drum parts. Now, in 1977-78 Walt and Lisa played snare together at Owen J. Roberts HS and in 2006 they will be working along with Bob teaching the drum line. Kevin, Chris and Walt are all active now in the Reilly Raiders and having a great time doing parades and concerts. Some East Coast kids from the 80s and 90s had fathers who played in competitive senior corps in the 60s and 70s. Kevin's dad was a Yankee-Rebel and Walt's dad and uncle were Reilly Raiders. Kevin actually gets to play with his father Jim in Reilly today! Such involvement gives you an appreciation for knowledge of drum corps history. From the right: Rich (Spokane Thunder), Matt (Seattle Cascades), Devin (Seattle Cascades), Chris (Spokane Thunder), Ryan (Oregon Crusaders), Michael (Seattle Cascades and Oregon Crusaders), Katie (Spokane Thunder), Dillon (Oregon Crusaders), Sean (Spokane Thunder).